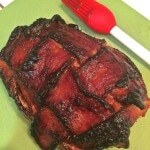 This recipe for Bacon Wrapped Meatloaf will take ordinary meatloaf and give it a flavorful boost! Wrapped in Bacon, then brushed with BBQ sauce it will become a much requested recipe! There aren’t many things that won’t be better with bacon. Seriously, bacon in this Bacon Wrapped Meatloaf takes a classic standby and makes it sing. 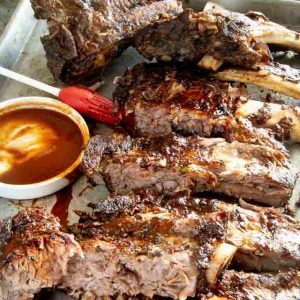 You wrap the meatloaf in bacon and brush it with your favorite BBQ sauce, it’s now a combination of a myriad of tastes, paired with both crunchy and succulent sensations. Pretty amazing things going on here! The bacon is crunchy, salty, tangy and sweet and caramelizes to a beautiful deep color when baking. 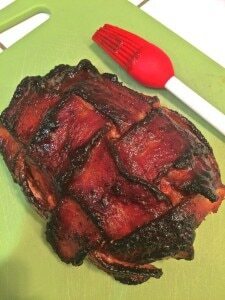 The meatloaf has hints of smoky bacon and is very juicy and tender. 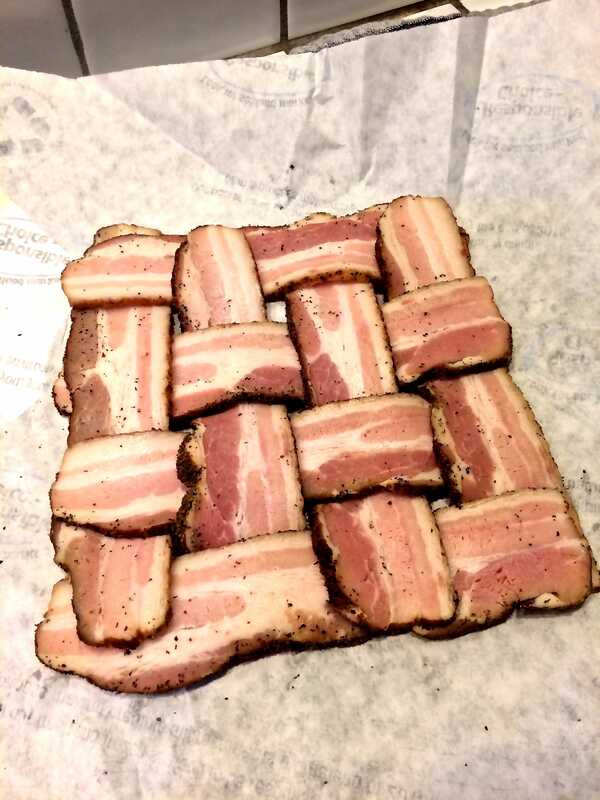 The presentation looks difficult but is actually really easy; interweaving the bacon for the crust makes it look like a restaurant made it. 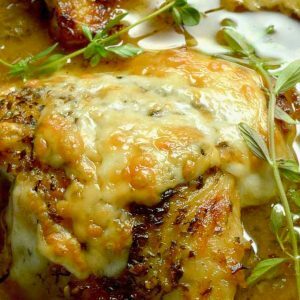 Another plus— you now have a comfort meal that you can serve for company….. win/win in my book. 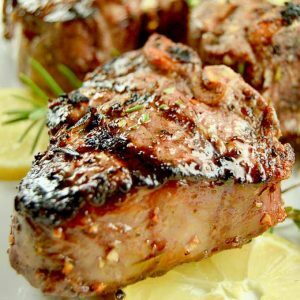 Secret Trick to eliminate fat from Bacon Wrapped Meatloaf! The one “must” in this recipe is to not make the meatloaf in a loaf pan like our moms did. (The loaf pan doesn’t allow for any of the fat to drain away, so the meatloaf gets really greasy.) If you make it on a broiling pan with the holes in it for the fat to drain down to the bottom it not only makes it less fatty, it’s also much healthier. A kicked up version of the family meatloaf! 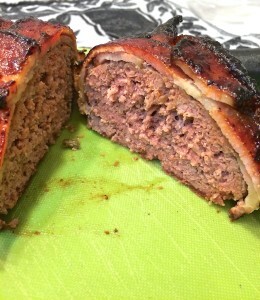 Plain Jane Meatloaf, wrapped in bacon that you brush with a spicy BBQ sauce! Add Onions, Parsley, Salt, Pepper, Panko and egg. Mix Thoroughly. Place Pan in oven on shelf closer to the top of the oven for 45 minutes or until temperature reaches 160. Brush Bacon periodically with additional BBQ sauce as it is cooking. Remove all toothpicks, slice and serve. Place 3-4 strips of bacon vertically next to each other. Fold back every other one. Insert one additional piece of bacon horizontally. Then pull down the bacon you had flipped up, and flip back the ones that were flat. The bacon should go over one piece, then under another the next. 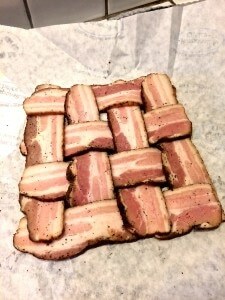 Keep weaving until all of your bacon is interlaced. There are great tutorials on you tube and food network showing how to do this with pie crust if you need some additional assistance. Use a baking sheet with a wire rack laid on top of it. Just so the fat from meatloaf is allowed to drop to the lower pan away from the meatloaf. Look at the first picture in the blog. The silicone brush works so much better than the paint style brushes (aka pastry brushes) I know its an additional tool in your kitchen but the silicone is easier for cleanup and worth the cost. All recipe nutritional information was calculated on what I purchased to make this recipe in My Fitness Pal. When you make the recipe, the calorie content could vary depending on what specific ingredients/brands you actually use. Please take that into consideration if you are following a strict diet. 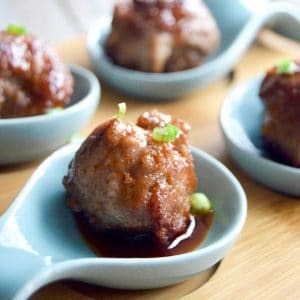 These are really good and so easy to make, it makes me wonder why I ever put up with the frozen ones at home or restaurants. I agree! So much better at home!